Welcome to SS Metal Worx, Inc.
All custom products purchased from SS Metal Worx include a 1 year warranty on parts and workmanship. We offer in-shop and on-site service to repair Vibratory Feeder Bowls, connecting track, parts isolation systems, and bulk storage hoppers from any manufacturer or provider. 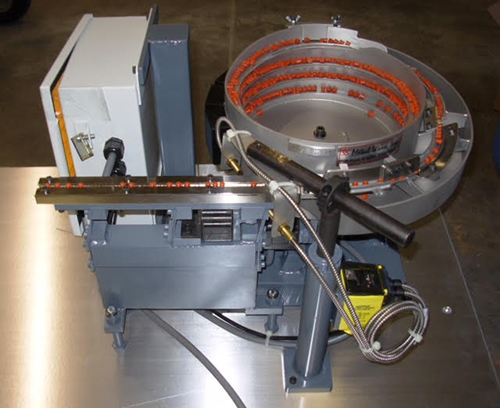 SS Metal Worx supplies a variety of replacement parts for Vibratory Feeder Bowl systems from all manufacturers. DOWNLOAD OUR BROCHURE FOR MORE INFO! SS Metal Worx has over 100 combined years of experience in the manufacture of Vibratory Feeder Bowls and all related systems, including bulk storage hoppers, connecting tracks, parts isolation mechanisms, support structures and sound-deadening enclosures. SS Metal Worx prides itself for being able to cover many different industries. If you do not see yours below, please reach out as we are very versatile.